Remodeling basements into rooms that offer more than simply being a storage space is becoming a much more popular and cost-effective way to expand the habitable space in your home and in this Home Flooring Pros guide we take you through 30 of the best basement flooring ideas we could find. With the right vision, and good contractors to tackle some of the trickier aspects, you can re-imagine your under-used subterranean space into the ultimate games and entertainment space, a magical kids playroom, a super functional laundry room, a multi-purpose home gym, or a luxurious spa complete with sauna and plunge pool! And just as the options for how to use your basement are endless, so are the basement flooring ideas to go with them! In fact just about any flooring idea that you might have for the main part of your home can be fitted into your basement remodel, but as basements are also the part of your home that is most prone to damp and moisture, you do need to ensure that the foundation is correctly sealed before fitting the final floor finish. As well as moisture levels, you also need to be sure that basement floor joists are free from rot or insect damage. And you’ll need to ensure that you’ll have the required minimum of 7 feet hear clearance to the ceiling – if not, you’ll need to consider digging down and pouring a cement floor. 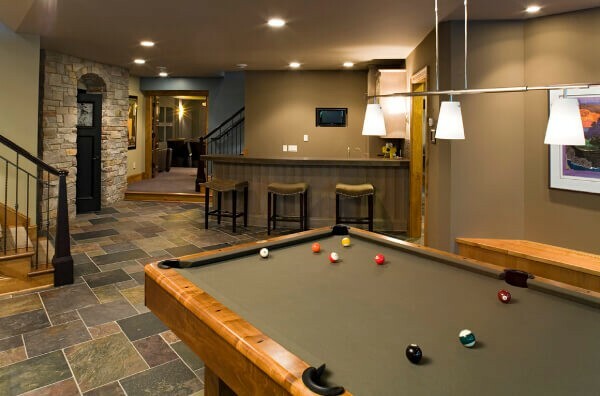 Of course, there’s a lot more than just the flooring to consider in order to ensure that your basement remodel will be the warm, inviting, usable space you want. But once you have done all the prep work, the decisions regarding the best basement floor idea for your home become fairly clear. If you are concerned about moisture levels, ceramic tile is a good option but can be a bit cool underfoot. To combat this you can also use floating luxury vinyl tiles (LVT) that are available in a range of authentic designs including perfectly realistic wood-look and stone-look; just like ceramic tiles, LVT is highly resistant to warping. Another option for damp prone spaces is to use cement or concrete floors, which can be stained to a glossy, up-market finish. If damp and moisture is not a problem in your basement at all, then the world is your oyster – in flooring terms – and you can chose anything from real hardwood, to luxurious carpeting and anything in between! As with any other room in your home, the choice of flooring you use can really complement and tie together whatever décor design ideas you have, so below we’ve collected some fantastically inspiring basement flooring ideas to get you going. As mentioned above, if you are absolutely sure that damp is not going to be an issue in your basement remodel, then hardwood flooring is a great basement flooring option for your space. Even so, I would definitely still advise opting for an engineered hardwood as the multi-ply structure makes it much more resilient to changes in temperature and humidity. It is also advisable to install a good quality underlayment pad under your floating engineered hardwood floor to combat moisture and maximize warmth, comfort and soundproofing. 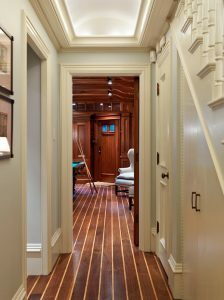 Wooden flooring will instantly make your basement feel warmer and cozier, and has a very broad appeal that will work in your favor if you ever decide to sell your home. 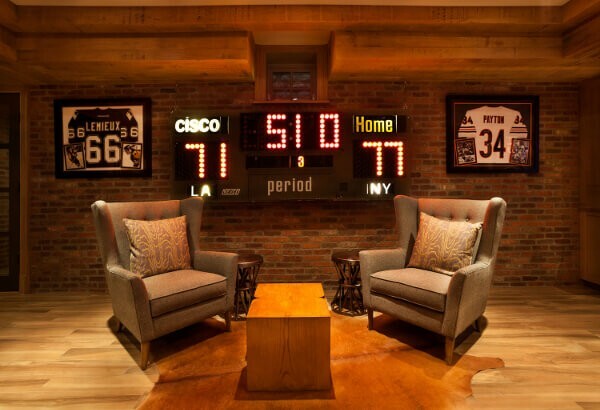 Design-wise, if you are concerned about your basement space being too dark and dank, then opting for a lighter wood such as a maple or an oak with natural or whitewashed finishes will make for a comfortable, family-friendly space; on the other hand if you want to create a club-like man-cave, then a deeper, darker toned wood is a better idea, giving your space a more intimate feel that is reminiscent of sports bars and pool halls everywhere. For more information on buying, installing, cleaning and prices for solid and engineered hardwood flooring click here and here. This superb parquet inlay is pure old-school class – perfect for a grown-up underground clubhouse. 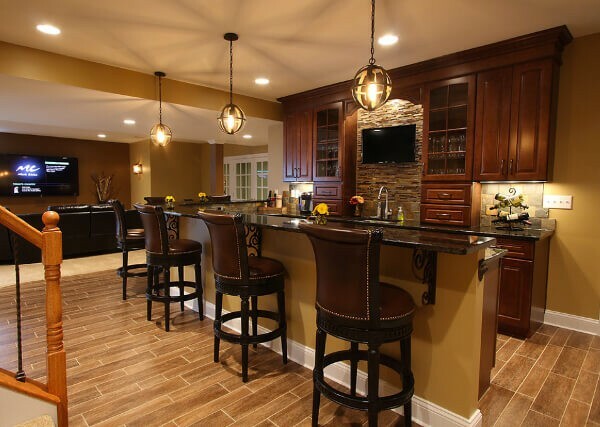 Warm hardwood flooring works beautifully against exposed brick for a cozy basement bar. 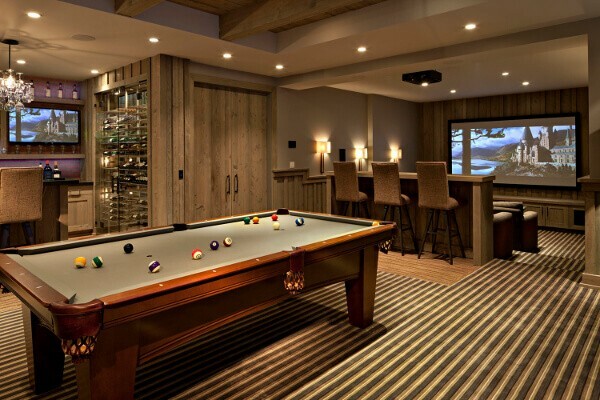 The medium-toned hardwood flooring works well with a wood clad ceiling in this basement games room. A lovely traditional hardwood floor paired with light furniture and soft furnishings is ideal for a basement family den. Make your basement bright and airy with light hardwood basement flooring, chrome fittings and great lighting. 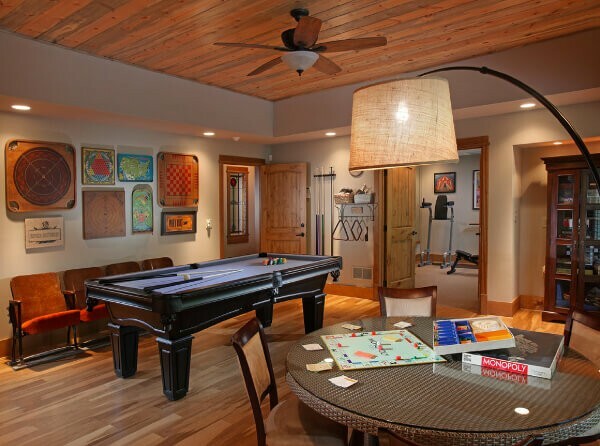 On-trend gray hardwood flooring adds to the clean, contemporary feel in this basement games room. Ceramic and stone tile flooring can certainly also be used in dry basement spaces, with the added advantage of being an excellent basement floor idea if you also have radiant underfloor heating. Without underfloor heating, tiled floors can get very cold in winter months, so you would need to consider adding area rugs or other heat sources if your heart is set on this option. Ceramic tile is also an excellent idea if you are concerned at all by flooding, as it is unlikely to be affected by standing water. As far as aesthetics are concerned, because of the somewhat cooler feel of tiled floors, they seem to naturally lend themselves to a décor style that is more traditional in flavor – think farmhouse chic or rustic ranch-style – complimented with warm brown, green, golden and neutral tones. But as the choice of ceramic and stone tiles is truly vast, you can just as easily create a basement space that is more cool and contemporary, using gray or patterned tiles to great effect. And adding punches of bright warm colors like red to you your soft furnishings will keep your basement space from feeling too gloomy. Find tile buying, installation and cleaning tips, along with pricing info, by clicking here. If you like the look of hardwood but fear moisture levels, then attractive wood look ceramic tile is the way to go! Flagstone flooring used in this traditional ranch-style basement remodel is warmed up with beautiful wood and leather furniture. Colorful multi-toned slate tiles provide the perfect background for this comfortable basement remodel. 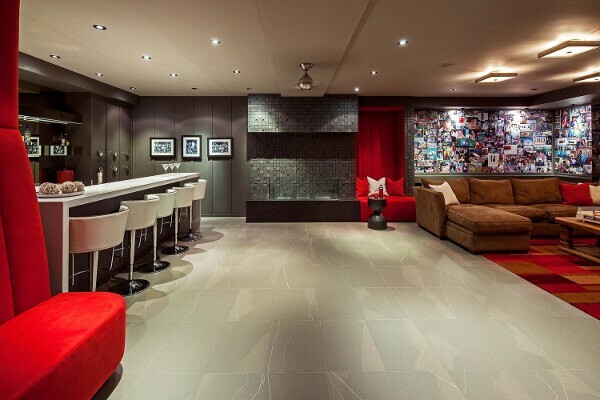 Lightly veined gray floor tiles combined with chrome and red accents fort his upscale contemporary basement bar. 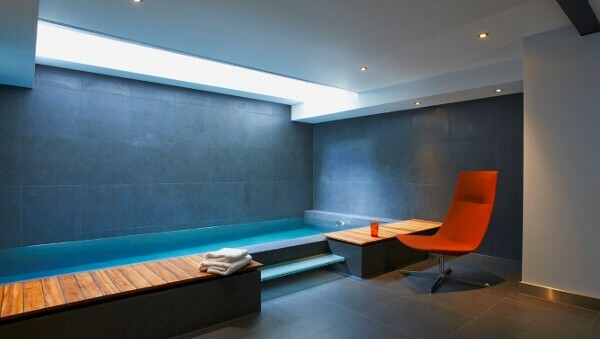 This gray tiled fabulous underground pool and spa is the perfect place to escape from the real world. 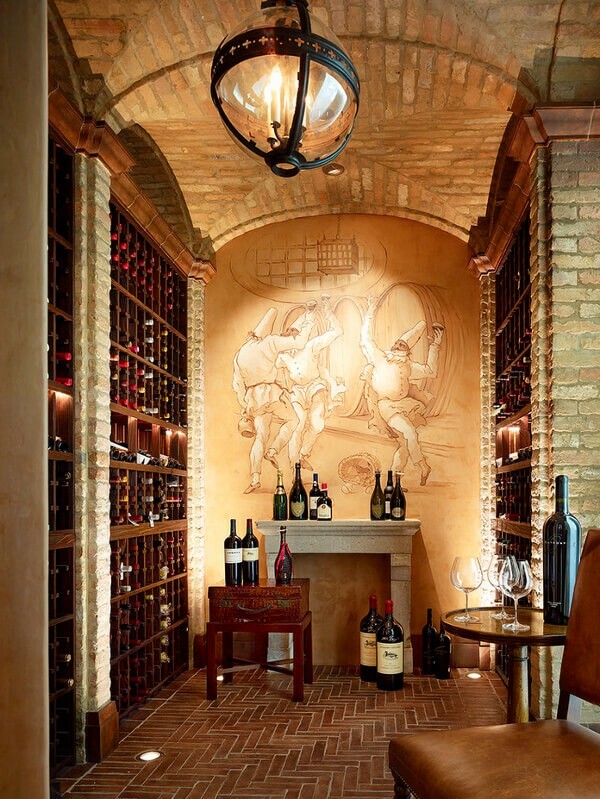 Stock your wine in style with a basement cellar, complete with vaulted ceiling and stylish herringbone brick floor. 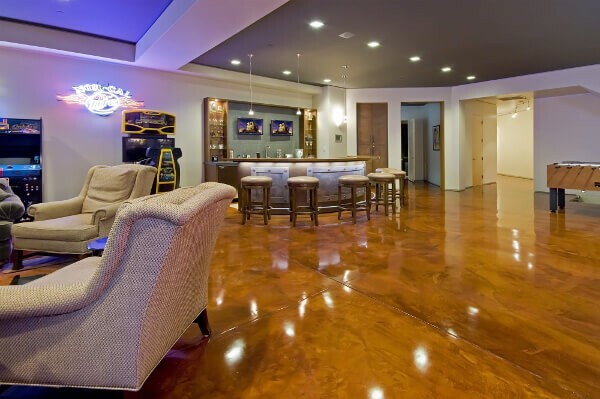 Also sometimes referred to as cement floors, concrete basement floor ideas are perhaps the most hassle-free option for your remodel, not least because most US homes already have poured concrete floors in the basement anyway! The main thing to factor in with concrete is that it does expand and shrink with temperature changes, so there is a chance of cracks appearing over time. Using an experienced contractor to pour and finish your concrete floor will help minimize this risk. Another consideration is to ensure there is good soundproofing in the walls and ceiling of your basement, as concrete floors – rather like ceramic tiles – do tend to bounce sound of them rather sharply. When considering the overall design ideas for your basement, it is perfectly fine to use the existing concrete slab – particularly if you plan to use the space as a utility room or workshop, or if you want a more rough and ready industrial look. But the great news is that existing concrete floors can also be overlaid with decorative concrete finishes like color stains, polishes and pattern stamps to create a very unique flooring to suit your space. 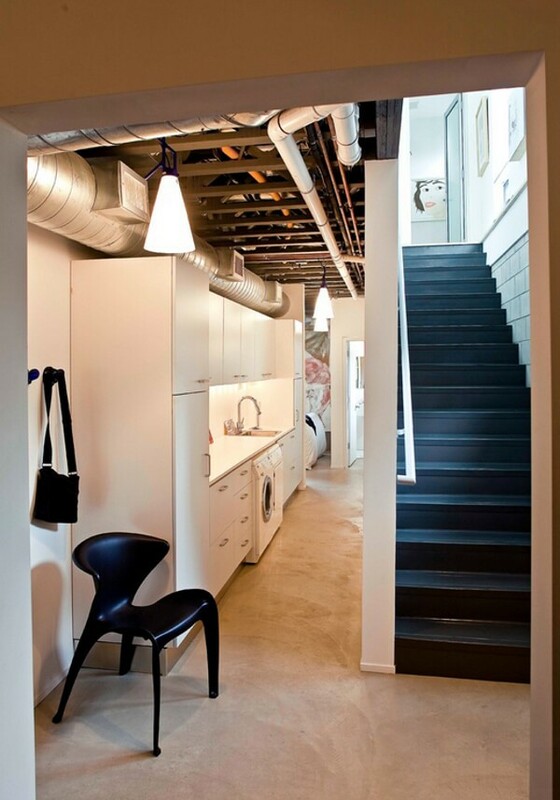 This renovated basement laundry room is clean and simple with its unfinished poured concrete floor. 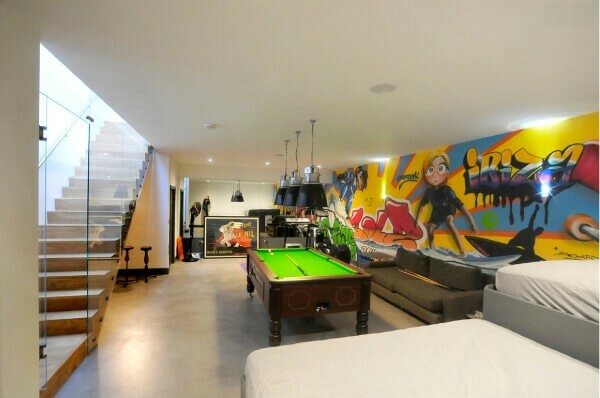 Here the concrete has been left unstained but buffed to a soft sheen to create a neat, contemporary family games room. A dark gray stained polished concrete floor is the perfect idea for a smart urban industrial décor style. This floor has been so beautifully stained and highly polished that many wouldn’t even realize it’s concrete. 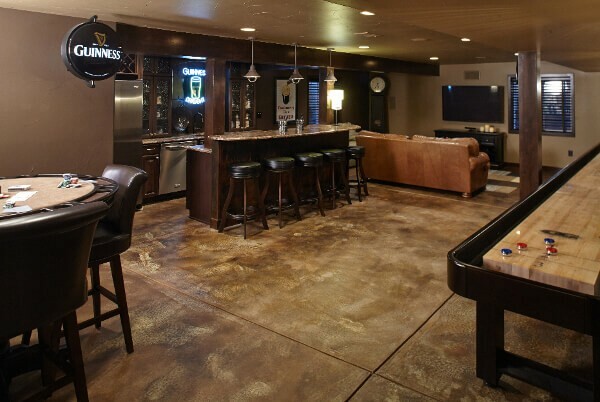 The rougher brown-gray matt stained concrete floor is a great choice for this rather moody man-cave! Here an eclectic mix of industrial and contemporary fittings is complemented by the buffed unstained concrete floor. The major advantage of choosing to carpet your basement floor is that the softer material will provide comfort, warmth and soundproofing. Of course the worry is what to do about potential moisture and damp (moldy carpet is really not something you want in your home). But basement flooring ideas involving carpet installation is completely possible as long as you do all the prep work to ensure that damp doesn’t get to it! Essentially you need to make sure that there’s an adequate barrier between the carpet and the concrete subfloor that will allow moisture to escape as it dries – there are lots of online DIY guides like this one to give you an idea of how to proceed. Once you’ve done all that work, the only other thing to consider is which of the many, many carpets out there to choose from. Choose wisely for neutral colors in plush piles will certainly create a lovely nest-like atmosphere underground – excellent for a family den or a home cinema, but prone to picking up dirt and stains; whilst patterned carpet is a great choice for an underground space that expects a lot of party action as the patterns can hide a multitude of party accidents! 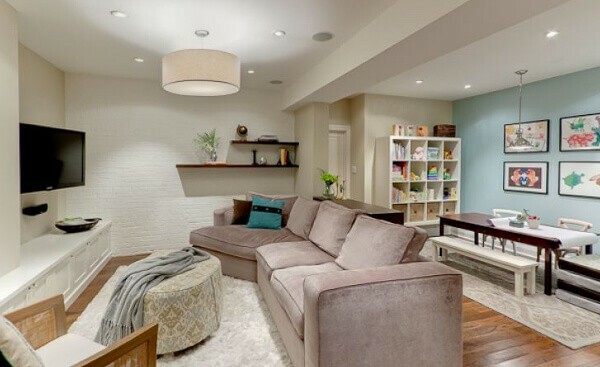 Cream carpeting, walls and furnishings makes this basement den super cozy. This striped carpet is the perfect idea for a comfortable easy-to-use entertainment space. 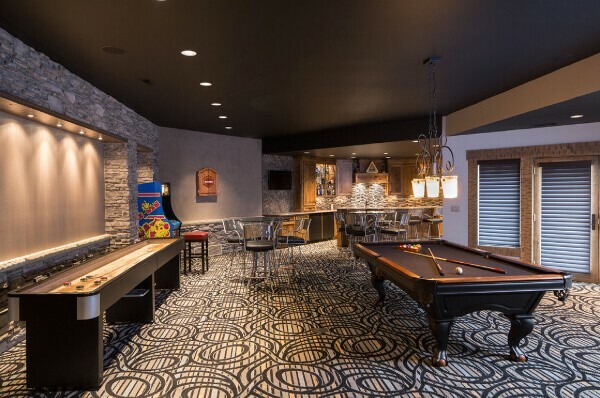 This boldly patterned carpet is the perfect party accessory in this basement games room and bar. 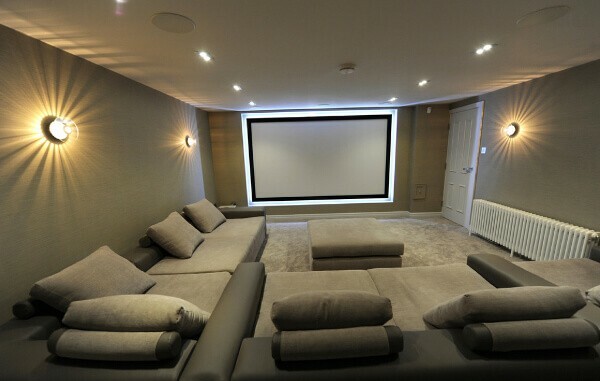 This sumptuous, plush neutral carpet toned with matching walls and sofas makes for a perfectly sophisticated family home cinema. 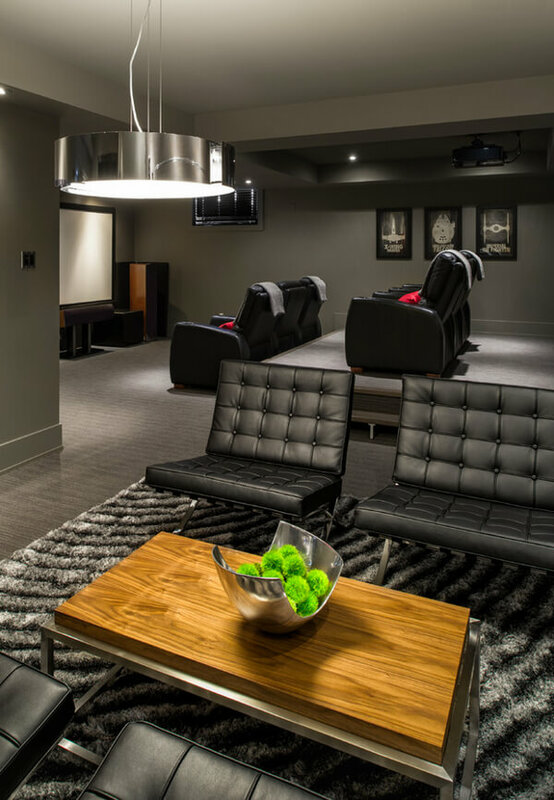 Dark gray carpet and black leather upholstery in this basement cinema room is rather more edgy and cool. 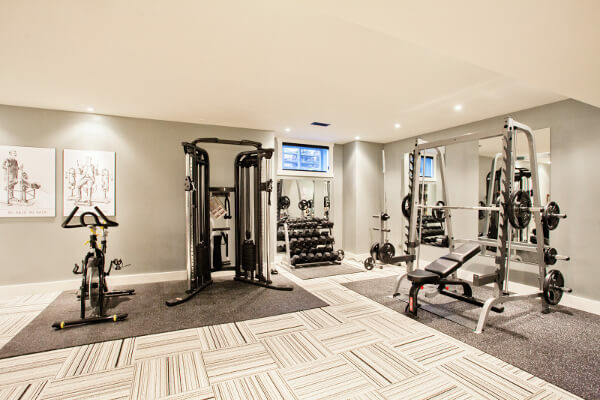 Patterned carpet tiles are a great choice for a clean and stylish underground home gym. 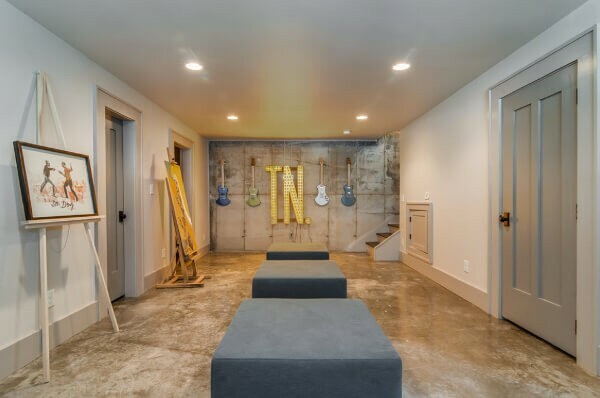 Aside from all the usual types of flooring, there are other alternative types of flooring ideas that will work equally well in a basement depending on your needs – rubber floors for example are great for home gyms, or laundry rooms and cork flooring provides superior soundproofing for kids playrooms or band practice rooms. 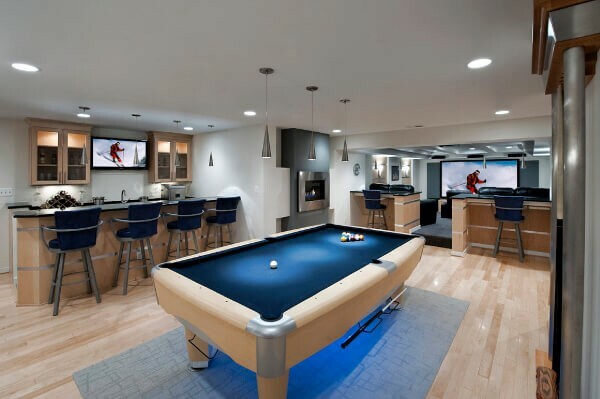 Of course, one of the best things about remodeling a basement is that it’s the kind of space you can really go to town on in terms of making it your own. 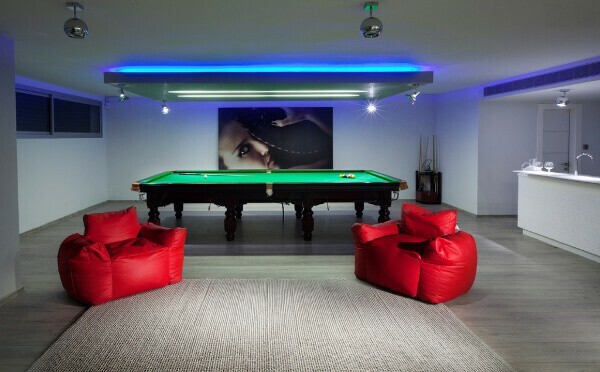 Your underground hideaway can be the one place in your home that you can really let your hair down, relax and be yourself; so personalizing it to the max with a customized basement floor idea is the obvious choice. 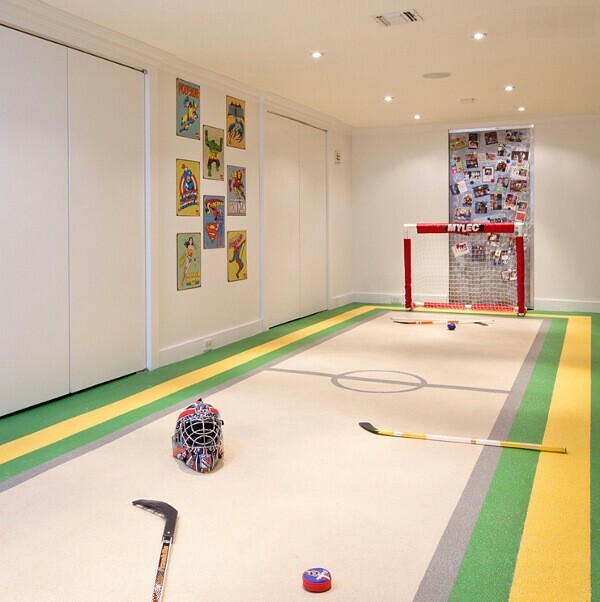 A customized floor is particularly great if you’re creating a basement playroom or games room for older kids – allowing them to have input in every aspect of the décor is a great way to get them personally invested in the space. As with any of the traditional floor ideas, alternative and customized floors need to be properly installed to ensure that you get to enjoy your basement remodel for years to come. 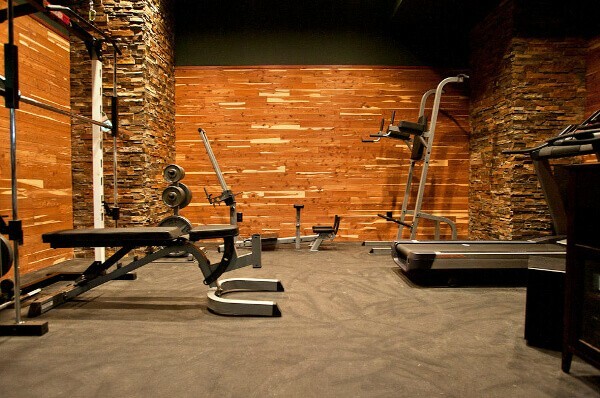 Gray rubber flooring is a practical choice in this underground home gym. Make your kid’s day with this fantastic indoor hockey rubber floor pitch! 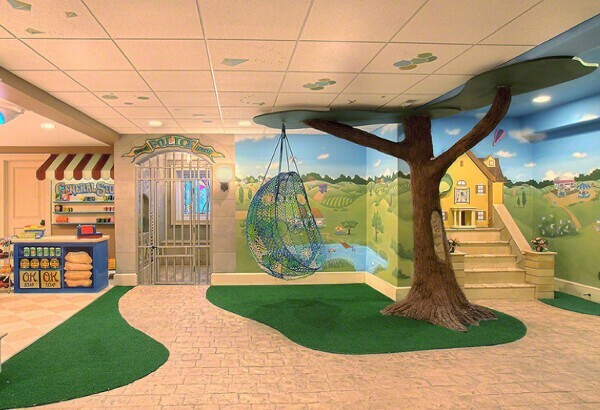 Or how about this amazing playroom – with green grass carpet and stamped concrete pavers “outside” and checked linoleum in the general store! This concrete floor has been given a custom paint and stain finish to add to the tropical jungle theme. 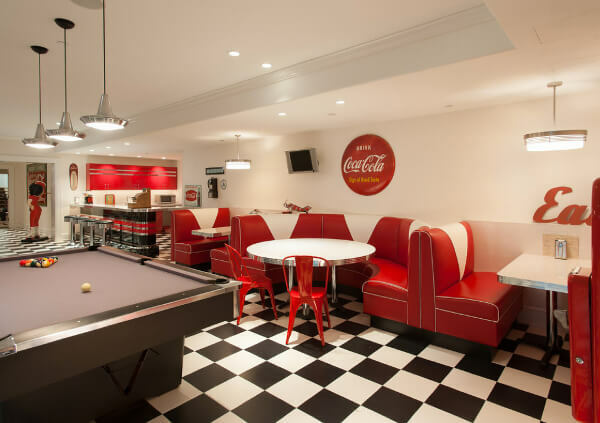 Black and white check ceramic floor tiles superbly finish this retro diner-themed basement games room and bar! 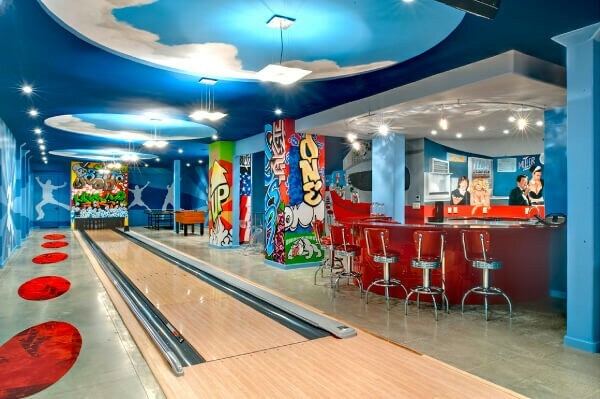 And if you have the budget and room, why not add a full-sized bowling lane to the mix! 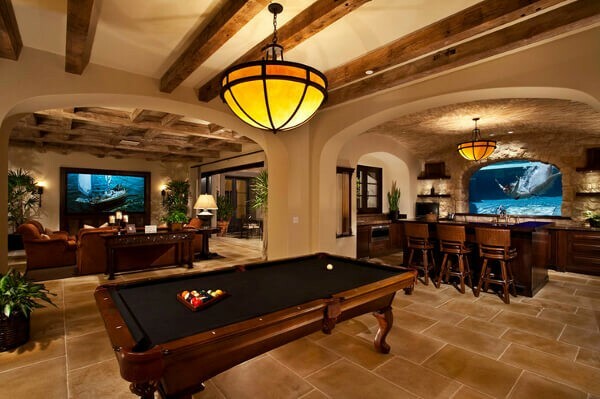 Oh, so you think you have some better basement flooring ideas? Well please do share them with us in the comments section below.